Last fall, Lou Huang was at a community meeting for the initiative to redesign Second Street in San Francisco. Planners handed out paper cutouts, allowing participants to mix and match to create their ideal street. Huang, an urban designer himself, thought the exercise would make for a great website. 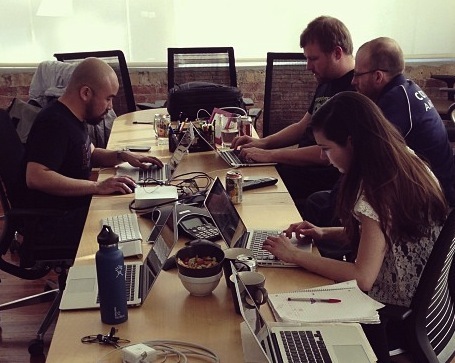 Now, after months of work beginning at a January hackathon with colleagues at Code for America, it is a great website. The principle behind Streetmix is simple: it brings drag-and-drop functionality to a basic street design template. Users select a road width and add or remove everything from light rail to wayfinding signs, adjusting the size of each feature meet their specifications. The first version of Streetmix went online in January, but the latest version, which has new features and a slicker design, launched less than two weeks ago. In that short time, advocates have used the website to illustrate possibilities for Dexter Avenue in Seattle and Route 35 on the Jersey Shore. Streetmix has profiled how people from Vancouver to Cleveland use the website. Residents of Sioux Center, Iowa, even used Streetmix illustrations in their campaign to stop the state DOT’s road widening plan in their town. “It’s giving power back to the people, allowing them to vocalize what their streetscape priorities are,” Huang said. While the website can be a powerful tool for advocacy, its creators are clear that it has limitations. “It doesn’t look like a CAD drawing,” Wichary said. “It’s deliberately much more playful.” A common request is for the website to include drainage and topographical features. But there are some features that might eventually find their way to future versions of the website. Huang said that one of the very first requests was to add a plan view, so users could have a birds-eye view instead of simply looking at sections of a street. Huang is also interested in adding geolocation features, so users can explore what other people have proposed for streets in their neighborhood. 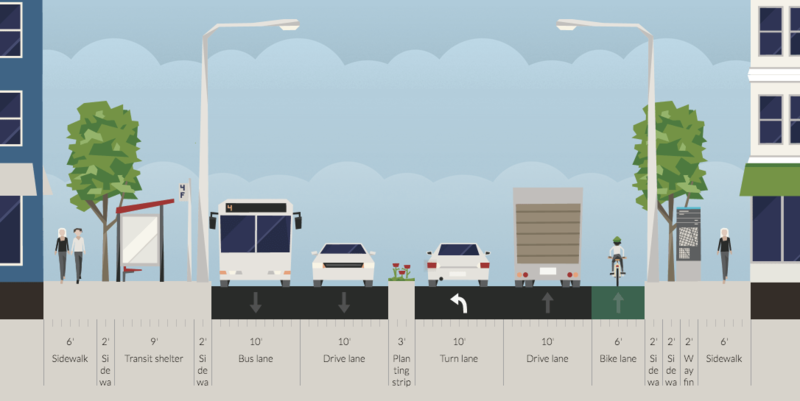 Some users have requested the ability to turn on and off design restrictions for certain projects — for example, setting a fixed right-of-way width or requiring inclusion of bus lanes, if those are the parameters of a particular street or campaign. It’s uncertain whether these upgrades will become a part of Streetmix. Huang and Wichary are both fellows at Code for America through November, working with cities across the country on tools for everything from criminal justice to food trucks. Nice, but your cross-section still shows buildings. Shouldn’t those have been bulldozed to make way for the elevated freeway? It’s not as fancy but I also like http://www.blockee.org, which lets you superimpose sparkly bike lanes, street trees, and other amenities over Google Streetview images. I don’t suppose anyone can recommend a traffic simulator. It’s just so goddamn beautiful. Exactly how it was and should always be. I like the cut of this Rob Anderson’s gib. This is my plan with consideration for loading trucks. The transit lane should allow cabs and there should be cab pullouts in the same space as the transit shelter. Sweet, but it needs a rural/suburban variant. The big issue in design around here is where to put the sidewalks and bike lanes relative to the *drainage ditches*. It’s usually not worth it to convert the drainage ditches to pipes. I’ve got variants with no transit shelters, with turn lanes instead. The street I have in mind has stupidly long blocks, so it’s good to put the transit station (as well as another pedestrian crossing point) in the middle of the block. I think the ROW might be even bigger than what I assumed, because it’s got stupidly wide frontage/parking roads. This is a great tool in democratizing road design processes. Because it allows us to change the direction of travel, it can be used in my country, Japan, where cars, including bikes, have to drive on the left side. This upgrades one of the ten busiest bus routes in the city to more cost-effective rail service, expanding rapid transit for tens of thousands of neighborhood residents. It connects visitors to the Obama Library, the University of Chicago, and the Museum of Science and Industry. And it’s a catalyst for dense, mixed-use, affordable, transit-oriented development. I love this tool and will use it frequently, but it would great to see it supplemented with an overhead view option to help work with streets that have varying widths, curb cuts, driveways, and other obstacles to great biking and walking infrastructure. Also, the trickiest issues tend to be related to dealing with intersections, which could make some otherwise great looking cross sections actually dangerous to implement. Great article, I really liked it and your site is awesome. Thanks for sharing dude. 🙂 Bookmarked!